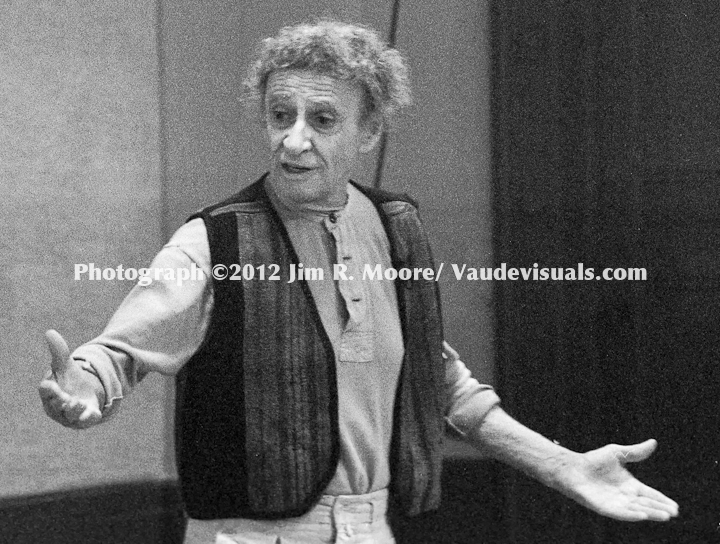 Marcel Marceau teaches a workshop in mime at City Center. Presenting a gesture to the class of students at City Center. One of the moments while explaining the mime technique he was teaching. I worked closely with Marcel Marceau for 21 years. I was fortunate enough to not only study under him, but later perform as an Assistant for his One Man show, and play a lead role in his final Company production that played in Boston in 2004. Having hosted five 2-week Marceau Summer Intensives at my School for Mimes in Ohio that spanned from 1986 to 1995, I watched how his teach evolved in his later years. 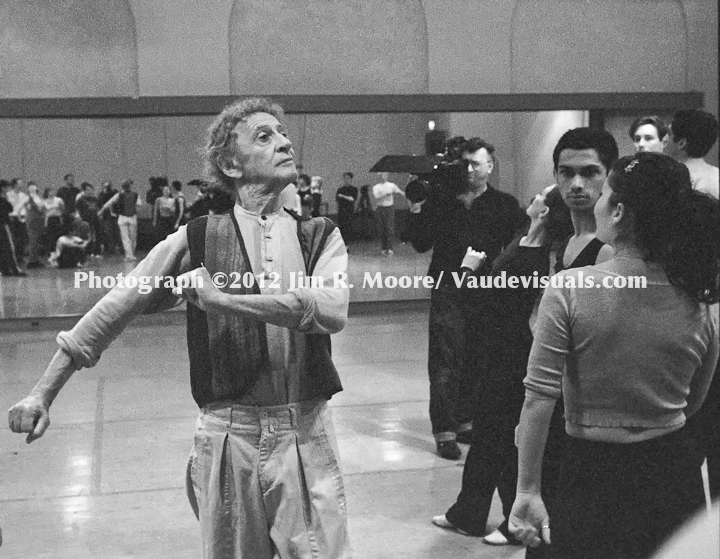 By the time of this workshop Jim Moore photographed at City Center, Marceau was at the peak of his teaching. This was due his efforts to codify “his” grammar that he had developed throughout his career, but had never completely organized. This effort made his teaching much clearer, and also enabled him to structure more complex material into the adagios he presented in classes. During these years, the work moved beyond technical, illusionary work and more towards mime acting studies. For me, the most valuable part of being in the classroom with him, (and what should be able to be studied in Moore’s photos here) is the analysis of his style from various angles. Meaning this: Looking at Marceau from the front – you see only the magic. Looking at Marceau from the side, you see the work. Note that his balance points are always on his heels, keeping his weight “off of his toes” like where a dancer would balance. This technique which moves from the “floor up – out through the arm – then into the public’s lap” is what I call “The Marceau.” He told me he invented this style of stage projection by combining what he learned from Chaplin with the fact that he had to perform solo on a stage for 3,000 people a night. Marcel Marceau was not only world renowned but such a giving teacher and director with endless energy and passion for the art form. He so generously offered his mastery; expressing shifts of emotion and character, quality of movement and a flying spirit that continues to touch hearts and embrace the world audience. He is missed dearly. I had the great gift of being a student of the master mime . 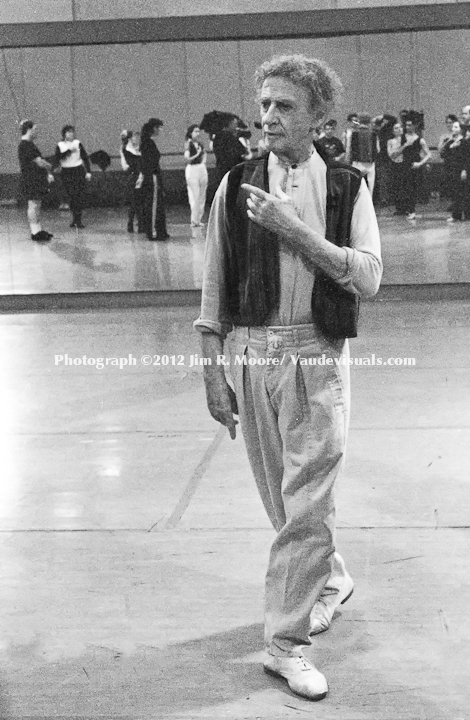 It was a one day workshop with Marcel Marceau in at City Center 1999. There were about 75 of us there. Mimes came from all over the country. Here was another opportunity to spend the day with the Master of Mime. All of us were diligently warming up in the studio getting sweaty and stretching and exercising to prep for the workshop. There were acrobats, dancers, actors and experienced mimes as well…. students with varying physical backgrounds.. He came in and stood watching us. I looked at him closely. His feet, already in a graceful fourth position, shifted slightly as if to embrace the ground, and with a gentle breath his upper body seemed to expand to fill the room. He made an almost imperceptible back tilt with his upper body . His chest and rib cage and his heart expanded. He was already energized. That was it for him. He took the stage. He filled the space. He showed us greed and joy and fear and every emotion. His clear motions came from inside out — from deep within and the entire room seemed to change color as he changed his expression. I was standing only 3 feet in front of him. Seeing him so close up was such an inspiring experience. I try to express the emotion as he does it… From toes to fingertips, arms, legs, body, face – but physicality was not the way.. “Immmpossssible! !” he said when I just didn’t get it . And he showed us again – his physical body expressed greed as if saturated by the inner emotion … and as I watched him , the world kept changing colors in front of my eyes. It was much more than motion. He shifted the entire atmosphere. His company performing in NY in 2000.